For the past weekends I started thinking about how to implement the FMS. MilViz its KA350i does not provide any external interface with the FMS. The only thing that is there is the FMS panel as part of the VC, and the FMS as 2D panel. The PL21 FMS has about 67 buttons in a very small enclosure, which all need to work flawlessly to have a nice user experience. The first topic I’ll discuss later on, but the current idea is to have a ‘Robot mouse’ that executes move and click actions within the 2D panels. 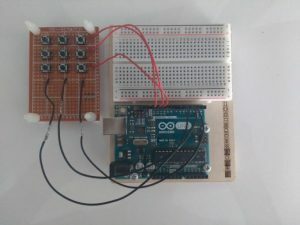 The second topic will be resolved by creating a 7×10 tactile button matrix using Arduino. Each button will be assigned an identifier that is recognized by the ‘Robot mouse’, which will in turn perform the related action(s). Assign to each button within a matrix of buttons a unique character. When a button is pressed, the character is sent to the serial port. On the receiving end a Windows application will read the values and the appropriate actions will be taken. e.g. 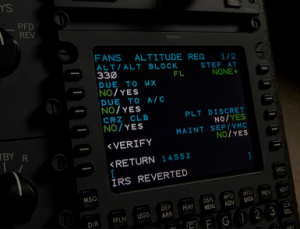 Pressing the button identified by 'A' will result in 'A' being pressed on the CDU in P3D. The circuit: matrix of tactile buttons. //Just send the key value. The library will add two characters: "\r\n"
The running code I’ll show in a video later on.